At long last, Gal*Gun Double Peace has a finalized release date that we can share with you all! As the title says, Gal*Gun Double Peace will be available in Europe on 7/15, and in North America on 7/19! PQUBE, Bristol UK June 15th, 2016 – If a Standard Edition just doesn’t do it for you, Inti Creates and PQube has just the thing! Feast your eyes on the Gal*Gun Double Peace Limited Edition, available on July 15th in Europe and July 19th 2016 in North America for PlayStation 4 and PlayStation Vita! The most deliciously feel-good shooter of the year from Inti Creates and PQube features Houdai, a young man who after being shot by a Cupid angel must survive an onslaught of smitten Academy girls hell-bent on declaring their love for him at any cost! Only by wielding a Pheromone Gun, which can deliver a dose of knee-trembling euphoria at the pull of a trigger, can he keep the girls at bay – and find a safe path to his one true love! 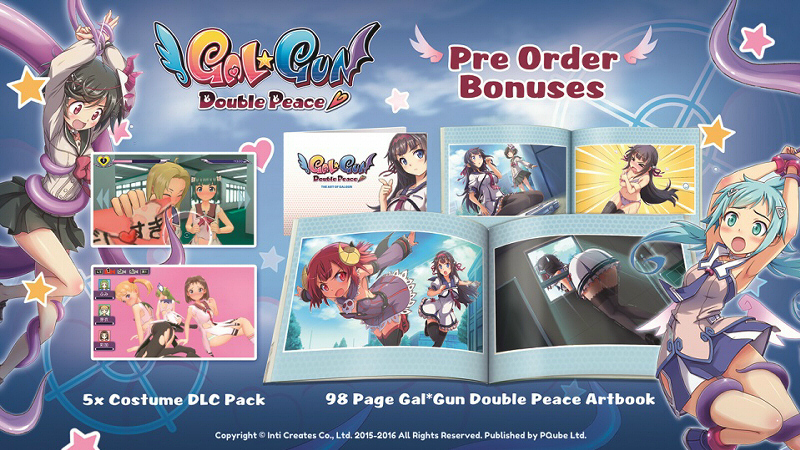 Additionally, if you choose to go with a Standard Edition, but (wisely) Pre-Order Gal*Gun Double Peace, you can also qualify for one of the following trouser-burstingly awesome Pre-Order Bonuses! Check with your local retailer to find out which one they are offering! Gal*Gun Double Peace will send your blood rushing to your…cheeks! – on July 15th in EU and July 19th in US on 2016 PlayStation 4 and PlayStation Vita! Previous PostOfficial Azure Striker Gunvolt Merchandise Now Available From FangamerNext PostInti Creates Will Be at Anime Expo 2016 With a Booth and Panels!